Here are the release notes for the R167 update! 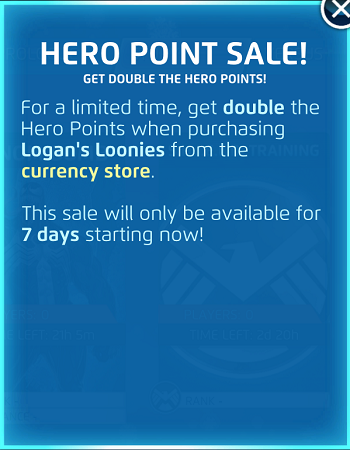 Hero Point Sale starts today, 12/3, and ends on 12/10! In wave missions, when an enemy power downs one teammate and causes another one to arrive, the newly arriving character will no longer fire passive powers in response. For example: you're fighting Carnage and he fires Symbiote Scythes, downing a teammate and causing Kamala Khan to arrive. "Bring Out The Best" used to fire in response to Symbiote Scythes; now it doesn't. Please Note: This is a fix specifically for when the enemy team downs their own teammate. Corrected behavior where "Full Points" would display before the event points were actually full. Alignment of "Tap Here" circle in tutorial missions has been improved.